Image manipulations are unfortunately a rather widespread practice in biomedical literature, where a large part of research data in figures consists of microscopy or gel images. Some of the most commonly detected issues in this regard are image duplications. These can range from possible negligence like duplicated western blot images, to deliberate data fabrication, evidenced by duplications of select image fragments such as gel bands. Sometimes, it is difficult to believe in the accidental nature of duplications: I reported of a case where one single western blot put an appearance whole twelve times in several publications by the Brazilian diabetes researcher Mario Saad and his colleagues. Some of his papers have been retracted by now. “3.8% of published papers contained problematic figures, with at least half exhibiting features suggestive of deliberate manipulation”. At the same time, some journals take action against scientist negligence and fraud. Several biomedical journals followed Journal of Cell Biology’s (JCB) example and screen all manuscripts for image irregularities before accepting them for publication, most prominently EMBO Press journals and Journal of Clinical Investigation. Generally, these analyses are done by human inspectors with talents like Bik’s. Of course such method is far from perfect, for example it can hardly uncover image re-use across different papers. In fact, JCB recently had to deal with a PubPeer-reported case where western blots were copy-pasted into a JCB publication (correction here), originating from papers in Genes & Development (now corrected) and Cell Death and Disease. The scientist responsible was Helin Vakifahmetoglu-Norberg, from the Karolinska Institutet (KI) in Sweden (which is already hit with Macchiarini and Sumitran-Holgersson misconduct cases). Correction: unlike I previously speculated, Norberg only moved lab inside KI, she was also awarded prestigious Swedish funding. At her new website she is recruiting “highly enthusiastic and hardworking postdocs and undergraduate students”. More advanced technology to detect image manipulations is being developed; new software allows the finding of duplicated images across the entire internet. Software developers and start-up business operators like Enrico Bucci hope that journals and publishers will become interested in their products. The funders like EMBO and ERC might also be well advised to engage the services of professional image analysts and their software, before distributing grant funding. EMBO recalled a prestigious Installation Grant to cancer researcher Sonia Melo, and revoked their highest award, the EMBO Gold Medal from the plant scientist and ETH professor Olivier Voinnet. In both cases, EMBO performed their own investigations and detected inappropriate image manipulations in the relevant papers by Voinnet and Melo. The European research Commission ERC however still puts too much trust into the peer review process as a mean to safeguard data integrity. This is why ERC found their € 2Mio Consolidator Grant to Susana González unexpectedly homeless, once González was sacked by her Spanish research institution for misconduct. By now also the pharma industry is indignant about the research misconduct their academic collaborators engage in. Bayer HealthCare analysed 67 research projects, mostly in oncology, but concluded that “only in ~20–25% of the projects were the relevant published data completely in line with our in-house findings”. The US Biotech company Amgen attempted to reproduce results in 53 innovative cancer-research publications, and succeeded only with six of them. Most recently, Merck’s Vice-president Michael Rosenblatt complained that “industry expends and universities collect funding, even when the original data cannot be reproduced”. He then suggested universities must refund the money back to the industry, should their industry-supported research prove irreproducible. This seemingly innocent proposal is peculiar, since in 2004 Merck covered up evidence of the health dangers of their own drug Vioxx, which they then had to recall and pay millions in damage compensations for. Therefore, it is not like biomedical industry were a hapless victim of unreliable academic research. The following case of a Californian lab of the pharma giant Pfizer suggests that the industrial biotech may have their own issues of research negligence, or possibly even worse. In February 2016, I was contacted by a concerned scientist (whose exact identity is known to me), who told me about image irregularities in cancer research publications from the laboratories of Pfizer in La Jolla, California. The suspected irregularities this person reported on PubPeer ranged from duplicated western blots to duplicated bands inside western blots (see examples below). The papers in question were all authored in the last couple of years by the industrial cancer researcher Min-Jean Yin, since 2003 Senior Principal Scientist at Pfizer. Her LinkedIn profile states that she published “32 publications in top tier journals (Cell, Nature, Cancer Research, etc.)”. “Your note to Dr. Yin and Pfizer’s Executive Leadership Team has been forwarded to my attention. We take concerns such as the ones you have raised very seriously, and we will review the matter thoroughly. As this is the first we are hearing of this situation, we have no comment at this time”. “We have initiated a thorough review of the allegations you have made regarding possible duplicative images in several papers. Due to the lapse of several years since the original experiments were performed and the comprehensive nature of the review, it is still ongoing. We intend to get back to you when our review has been completed”. The following publications all have Yin as last and corresponding author. I could get these duplications confirmed, but neither did the editors deny the problem. Instead, I was repeatedly told the matter is being investigated. 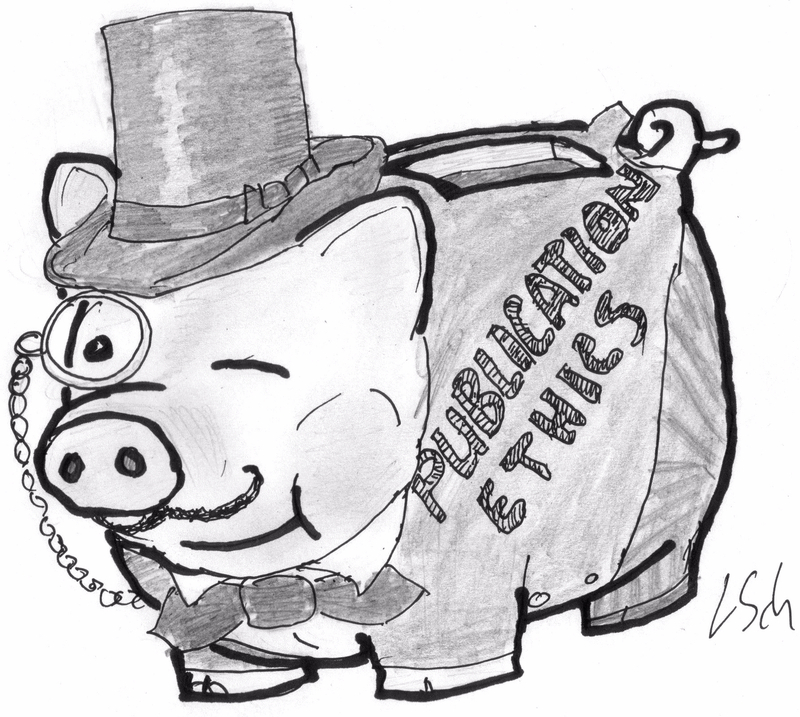 One interesting side-information I obtained: some academic editors of Elsevier-published papers delegate the entire responsibility for editorial integrity to Elsevier. Concerns of data integrity are investigated centrally by Elsevier, it also appears that the decisions about what to do about confirmed data manipulations are made inside the publisher’s offices as well. This is somewhat peculiar, since the editors of most Elsevier-published journals are by no means Elsevier employees (like those at Cell Press and The Lancet), but independent university-tenured academics and active researchers. “The case for Cancer Letters is from 5 years ago, we will see how we may respond to this. This is mainly done by the Office for legal affairs of the Publisher”. “We have followed up on this particular case and it is still ongoing. Unfortunately they can take time to resolve but we always pursue them until we reach an outcome”. “we hope to reach a resolution in the next few weeks. We will reach out to you when the journal’s follow up is complete”. “We take seriously issues related to potential image manipulation in one of our articles. This matter is currently under review”. “I see below that you sent the original email in February, however, I cannot find the previous email in our inbox, which leads me to suspect the original may have gotten caught up in our junk/SPAM filter”. “Our Editor-in-Chief forwarded your email to us. Thank you for alerting us to the suspected incidence of image duplication. We intend to investigate and will take appropriate action depending on the findings”. As far as I know, my emails never landed in anyone’s spam filter accidentally. Since I wrote to Knudsen’s institutional email address and not to AACR, either her own emails land in AACR spam filter, or, more likely, my email and the issues I reported were not really that welcome. The following paper is the only one where Yin and her lab were a collaborative contributor, the last and corresponding author is Martin Gleave, urology professor at the University of British Columbia. Lamoureux et al “Suppression of Heat Shock Protein 27 Using OGX-427 Induces Endoplasmic Reticulum Stress and Potentiates Heat Shock Protein 90 Inhibitors to Delay Castrate-resistant Prostate Cancer”, European Urology, 2014. “We write to inform you of an error in Figure 6 of this paper. During the assembly of Figure 6A, pictures were mislabeled and inadvertently added twice in different conditions in the panel. A corrected Figure 6 is provided (revised Fig. 6a). The repeat staining and analysis are consistent with the original paper and do not affect the overall interpretation of findings or conclusion of the paper”. Therefore, at least once image duplication concern voiced by the whistleblower on PubPeer was now officially confirmed. What about the other five Yin publications, with some potentially very damning evidence? Let us see how Pfizer and the journals respond, I will update this story with new developments. Update 11.10.2016. the case has now been resolved, read here how. There is only one term for this: the near-death of editorial independence. It’s that darned postdoc who has left the lab again. I disagree with your sentence: “…González was sacked by her Spanish research institution for misconduct.” She was fired by CNIC based on findings that have not been disclosed. In a statement released by Dr. González, CNIC motivations for the firing were “irregularities” in her work that could not be considered sufficient to proof that there was scientific fraud (i.e. intention to deceive).